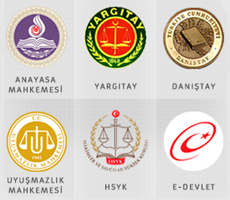 * With respect to the applications lodged with the European Court of Human Rights against the Republic of Turkey except for those relating to the international relations and foreign policy of Turkey, to demand information, documents and observations from the relevant institutions and organizations, to prepare observations and if required, to assign representatives to the sessions. * With regard to the individual applications lodged with the Constitutional Court, to submit the observations of the Ministry to the Court if deemed necessary. * To carry out activities for eliminating the human rights violations. * To organize friendly settlement meetings and to follow-up and conclude the friendly settlement process. * To take necessary measures concerning the execution of the judgments finding a violation, which are rendered by the European Court of Human Rights against our country; to circulate these judgments to the relevant authorities; and to follow-up the processes for elimination of the violations. * To ensure translation of the decisions and judgments rendered by the European Court of Human Right in respect of our country, and of certain judgments which are rendered in respect of the other countries and translation of which is deemed necessary; to compile and archive these judgments; to follow-up scientific studies concerning the European Convention on Human Rights and its implementation; to carry out activities for ensuring the practitioners to get access to the books, articles and case-law; and to carry out statistical studies. * To conduct projects in cooperation with the relevant public institutions and organizations in the field of human rights; and to organize national and international symposiums, seminars and training activities. * To perform other missions assigned by the laws.